A messy work space can be a creativity killer, so organizing your scrap space is critical. From paper to tools to embellishments, the opportunities for clutter are great, but not to worry...as there are just many ways to organize your space as there are scrapbook supplies. Not really, as there is no one "right way" to make a scrapbook, just what makes you happy. 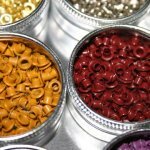 The articles below are some of my thoughts on the benefits and disadvantages to various methods for organizing your scrap space. What may work for me, may not work for you, but you might also find that it will take a few tries before you find a happy medium between what allows you to make efficient use of your time given the space you have. Keep in mind...some people have entire rooms, while others have the kitchen table, so there is room for extra creativity when it comes to organizing. Now, there is one "rule" when it comes to organizing your scrap space. Keep what you are going to use all the time at your fingertips (paper trimmer, adhesive, ink, etc.) and everything else in an easily accessible location. If you would like ideas on how to organize your scrapbooking supplies, and it isn't already listed below, just let me know by filling out this form. What is the one thing all of us seem to need?... 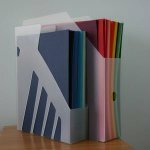 Scrapbook paper storage ideas. Ask a majority of scrapbookers what their "weakness" is...and they will say paper. From unique colors of cardstock to beautifully patterned paper, we often use the logic, "Buy the paper and the layout will come." When it comes to organizing ribbon for scrapbooks, I've tried several different methods, but eventually found a way that works for me. That's the thing about organizing ribbon for scrapbooks - there's no "right" way to do it, only what works for you and your scrap space. To organize small embellishments, like eyelets or snaps, I tried several different options before I came up with a solution that fit my style (and the quantity of embellishments that I have).